When the TLX was introduced two years ago, it had the mission of replacing not one, but two cars in Acura’s lineup. Expectations were high, at least ours were. In our minds, the TLX would combine the sensible personality of the slightly smaller Acura TSX with the sporty character of the slightly bigger TL. And it does, to a certain degree. Looking at the 2016 Acura TLX’s styling, it’s pretty obvious the brand isn’t trying to hunt down the Mercedes-Benz C-Class, the Cadillac ATS or the BMW 3 Series. It doesn’t have the sophistication and performance to match these luxury compact sedans, but its price is set accordingly. Where the TLX and almost all of the Acura’s products shine is not on the road, but down the road. As is the case with the outgoing TSX, the TLX offers two powertrain choices. A direct-injected, 2.4-litre four-cylinder engine is standard in base and Tech versions, managed by an eight-speed automatic transmission that sends power to the front wheels. With 206 horsepower on tap, this powertrain is fine for most drivers who don’t feel the need for exhilarating performance, and fuel economy is quite good, with city/highway ratings of 9.6/6.6 L/100 km. As soon as we get into the AWD versions of the 2016 Acura TLX, a 3.5-litre V6 is the mandatory powerplant. With 290 horsepower and 267 lb.-ft. of torque, the V6 cranks up performance a couple of notches and adds refinement to the drive, not that the 2.4-litre isn’t smooth enough for the task at hand. The TLX V6 can accelerate from 0 to 100 km/h in 6.6 seconds, which is fine. However, the bigger engine is matched up with a nine-speed automatic transmission. The one created by German supplier ZF. It’s a similar unit to the troublesome transmission found in various Fiat Chrysler Automobile and Jaguar Land Rover products. Admittedly, under normal driving conditions, the nine-speeder does its job and during our test, it didn’t exhibit any hiccups or jerkiness like we noticed in certain FCA vehicles. On the other hand, it was slow to react when we mashed to gas pedal to move into passing lane, emphasizing fuel economy before performance. It only quickens its pulse when the TLX’s drive mode selector is set to Sport+, but it’s still very far from emulating the machine-gun action of a dual-clutch gearbox. To top it off, there are so many gears to choose from, and during those slowpoke downshifts, the transmission felt more like a continuously variable setup than a conventional one. 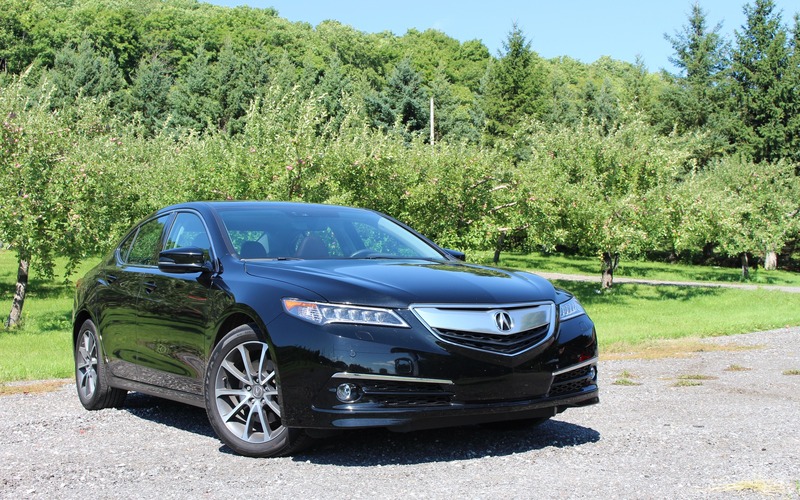 Like we said, under normal driving, the automatic transmission will nonetheless do its job, and does help the 2016 Acura TLX boast low fuel consumption. Thanks also to cylinder deactivation and automatic start/stop, we averaged 9.2 L/100 km over the course for the week, which is good for an AWD luxury sedan. Speaking of which, the TLX’s SH-AWD hardware is designed with performance in mind. It sends up to 90% of the engine’s power to the front wheels when the car is leisurely cruising in a straight line, but the split can shift to 55/45 front/rear under hard acceleration. While cornering, the system can throw up to 70% of power to the rear, and torque vectoring can even shift that power from one wheel to another. In short, the TLX handles well. Better than its conservative looks suggest. 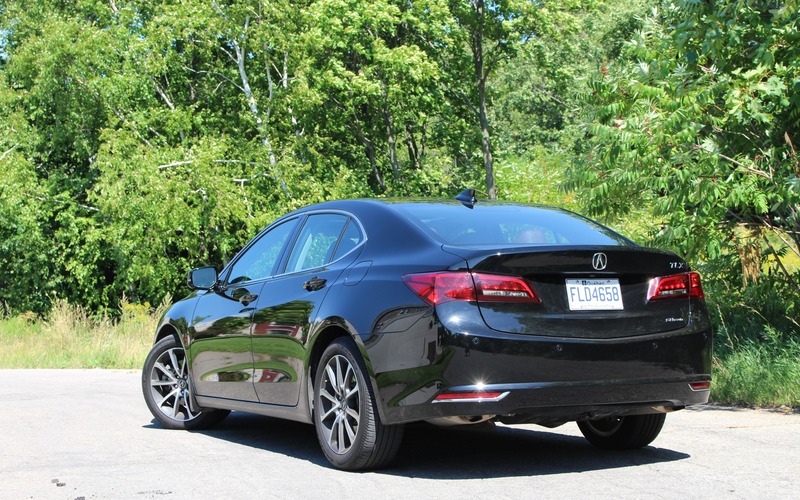 The 2016 Acura TLX also gets all-wheel steer, or what the brand calls P-AWS. Like most such systems on the market today, it pivots the rear wheels in the opposite direction of the front ones during low-speed cornering, and in the same direction lane changes. Stability and handling are both increased, but frankly, if nobody tells a TLX driver about this feature, he or she will likely never notice it. High-quality materials can be found everywhere in the TLX, especially the Elite trim level we tested. Ok, the glossy woodgrain trim isn’t all that dazzling, but the perforated Milano leather upholstery in Technology and Elite versions look pretty good. And the seats are comfortable for long drives, too. The technological aspect of the 2016 Acura TLX isn’t perfect, though. Instead of a conventional shift lever, the sedan is equipped with an unintuitive row of pushbuttons. Making them all different sizes and shapes doesn’t help, either. There are two screens in the centre console; the one on top isn’t touch-sensitive, while the lower one is. The navigation map graphics look old—typical Honda and Acura—and while the lower screen responds fairly well to finger input, some button zones are small and certain climate control features—such as fan speed and air recirculation—can only be adjusted in the on-screen menus and require multi-step operations. As is the case with many compact luxury sedans, the rear area isn’t all that spacious, and the middle occupant must deal with both a transmission floor hump and an overstuff seat cushion. On the other hand, two adults will be at ease sitting in back. The trunk is decently sized at 405 litres, and nicely finished too, as it should be. The TLX starts out at $35,490 before freight and delivery charges. Stepping up to the SH-AWD version with the V6 engine requires an investment of $40,490, while the top-rung Elite comes loaded at $47,990. That’s thousands less than a 340i xDrive or a similarly equipped C 300 4MATIC. As mentioned earlier, the 2016 Acura TLX may not impress at first glance. A typical luxury-car customer likely won’t be blown away after a test drive around the dealership, and the eventual owner probably won’t take their TLX down twisty country roads on Sunday mornings—despite its proven capabilities. The TLX is a car that will be more enjoyable in a long-term relationship. The brand’s reputation for reliability and solid resale value make its purchase a rationally logic one. The car’s conservative design, bland choice of paint colours and average performance envelope probably won’t make neighbours jealous—especially those who drive Mercedes’ and BMWs. However, ten years down the road, which car will end up costing less in maintenance and hold its value the most? That’s why people buy Acuras. 7/10	If we’re looking for a hot date or a short-term relationship, we should shop for something else. The TLX is more a rational choice than an emotional one.